Nope, like i said....months. However, Asda do seem to have more "local" deals than say Tesco. Absolute junk now it's UK-brewed in sunny Luton. Am I the only one who thought the taste was disgusting, I have had some crap beers in my time ( carling, heineken) but this stuff was foul. Even though it was free I poured most of it down the drain. Really like this stuff and also erdinger, dry January been a breeze with this. And will carry on drinking it through the year, as need to cut the units down a fair bit. Honestly feels like you've had a few beers having this. Better than drinking diet coke all night!! 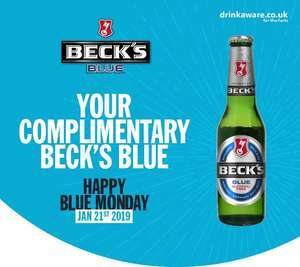 Becks Blue must be one of the worst, may the worst, non-alcoholic beers available! It's almost like Becks made it taste so bad on purpose! if you want a decent non-alcoholic beer try Brewdog's Nanny State or Big Drop's beers. That's pretty much where I am. I'll have the occasional alcoholic drink, but I've never been keen on the feeling even after a couple. Stuff like this is liquid gold for me. 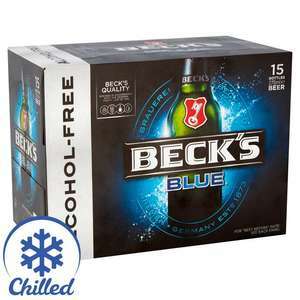 Good price for Beck’s. Currently £14 @ Tesco and £13 @ Sainsbury’s. 15 for 6 in Morrison's so that is marginally better. Taste is quite unpleasant and it's zero alcohol, which makes this worse than drinking a glass of tap water. Cold. Awful 'beer' and because of all the chemicals you end up with a hangover the next day. Also in Co op Swansea Quadrant along with San Miguel 10x440ml same price. Is a bier what you stand a coughing on? Sorry, couldn't resist. 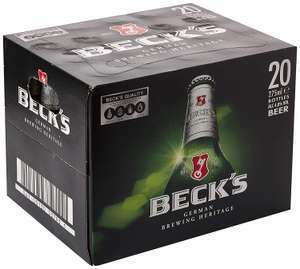 Never miss a 'Becks' deal again! Either the UK use slightly different ingredients. Or just the UK are not good at making them. But beer imported from the continent is nicer than stuff made in the UK. I quite like the aldi copy of becks, but this deal (party) takes some beating. Heat added. Special offer in my local Tesco, cannot confirm elsewhere but still £14 on the Tesco website. I checked the other day. It says brewed in the UK now :( Oh well. £13.20 in Scotland, bloody minimum price per unit! Assuming Staropramen is still in fact Czech, since it is "Brewed and bottled in the EU for Molson Coors Brewing Company (UK) Ltd". German purity law of 1516 Which is slightly better than the German purity law of 1939. Saw these in Tesco Extra Yardley, works out 52p per bottle. Cold, only £7.70 in my Tesco. Surprisingly, I find that Staropramen is still quite good even though brewed here. If I want imported Becks I have to go to one local shop which somehow manages to get tins of the imported stuff while all the others have UK brewed. Just bought loads of Budvar which is reduced at Tesco if you can find it. PS, how can you have a "collection"? Never lasts long enough with me! Thanks for the heads-up...just found I have a pack of both German &amp; UK-brewed Becks in my beer collection, and surprise, surprise , the UK brew is the poor relation, it just doesn't have that satisfying lingering tartness of the German brew, in fact it has no real character whatsoever. Another decent lager bites the dust in AB InBev UK's quest to save a few pennies transporting the original brew across the channel, it's all very sad. UK-brewed lager is 99% sh*te &amp; that's a fact. £7.70 Rtc at Tesco right now. Not bad for less than 50p a bottle. Was £5.10. Found (and brought!) in Royston. I don't give a feck! My bottles o Bud aint contributing to the Alcoholics demise. The sooner those feckin snp gits get sent back to the holes they came from the better. Nicola Sturgeon my god don't get me started on that fishy waste o space. It’s very cleaver deal. Says spend £30 get a voucher but the beer is buy 2 for £20 so you need to buy 4 also it’s not free delivery unless you buy 4 qualifying items . But end of day works out at £9 for 20 bottle which is a decent price especially in Scotland as we have min unit price . But amazon a breaking the law I’m happy with this loophole see how long it lasts . Like the way that these are 50.1% each, so you cannot get 2 of them in one Pantry Box! Clever amazon!!! It is £3.25 you have to go to fresh not pantry. Should be noted this is BECKS BLUE! Perhaps it's meant to make up for the lack of any fortified wine in the offer this time - something that only shows in very small print in store. In my local the ads were also well above head height. hopping in Sainsburys less and less now - and this puts us off even more. You're right. They've just done an awful job of promoting its inclusion. I suspect this is a mistake to be honest. Get your orders in while you can. Nice find - don't mind Becks :) Heat added!